Arkansas steeply terminated, doubly-terminated crystals have tan/white/green chlorite phantoms, rainbows, clear barnacles and penetrators, record keepers. 1-1/8x 2" overall. 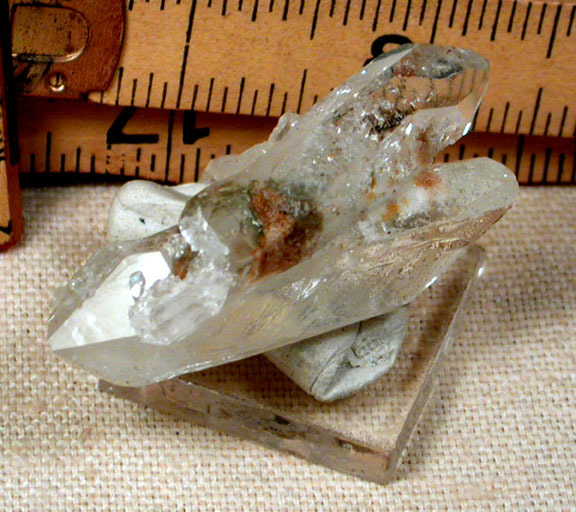 The larger crystal, a transmitter, has 4 MANIFESTATION crystals in it all taking up about 1/4" [you'll clearly see them with your loupe]. Home in under the main face at the rare round multicolored iris. Starry and geometric natural etching to both main crystals - a quantum healer.